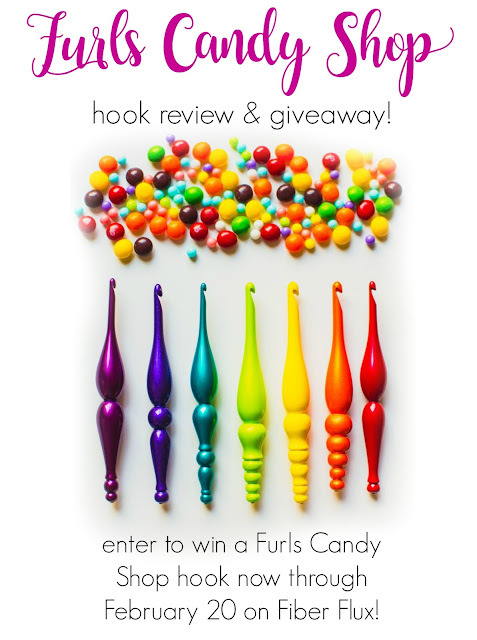 Fiber Flux: Furls Candy Shop Hook Review and Giveaway! Furls Candy Shop Hook Review and Giveaway! Photo from graphic courtesy of Furls. Happy Monday lovelies! Let's kick off the week right, shall we? 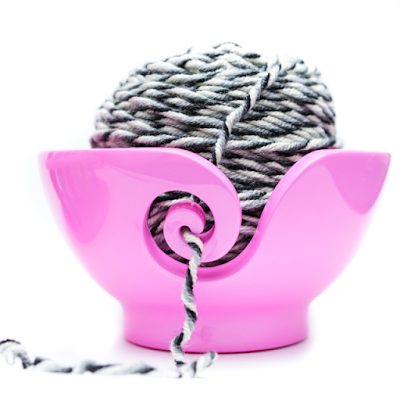 I was recently able to check out a Candy Shop Hook from Furls Crochet and wow was it fun! The good folks at Furls sent me a 9.0 mm Candy Shop hook in the "Plum" color (Thanks Furls!). If you're not familiar with Furls hooks, they are beautiful functional pieces of crochet hook art. The Candy Shop line is made up of sizes from 3.5 mm all the way up to 10.0 mm. 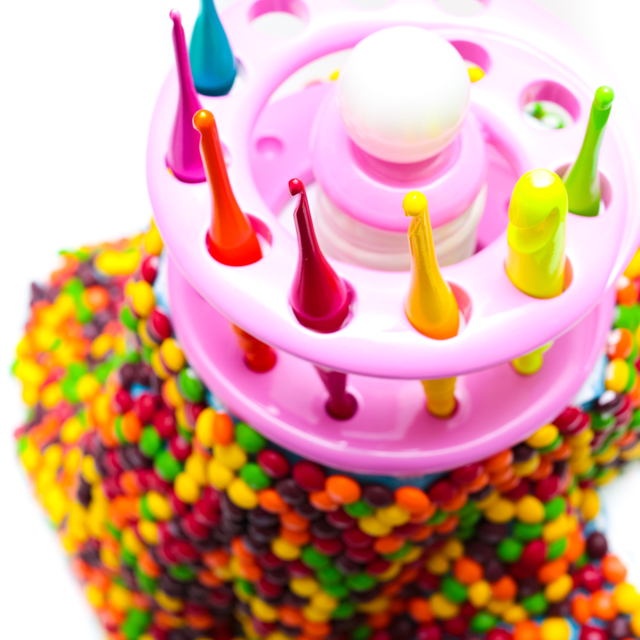 Each one is a different bright & happy color with names like "Cosmic Mint" "Mango" and "Butterscotch." How fun is that? Photo courtesy of Furls Crochet. The hooks are hand poured and hand cast polyresin, then hand sanded. They are then painted in beautiful, sparkly paint with a clear coat, making each one super durable. Now is your chance to win a hook of your own! One winner will receive one hook. No purchase necessary to enter. Void where prohibited. Open worldwide to entrants 18 and over. Enter to win using the Rafflecopter below (sometimes it takes a moment to load) Now go, go, go, and enter! Special thanks to Furls Crochet for sponsoring this giveaway! P.S. Furls has a gorgeous and really luxurious hook out right now for Valentine's Day. The Odyssey Gold has a 14K gold plated tip and gorgeous sparkly red handle...wow!! Get yours here! Awesome, Jennifer. Thank you so much! Thanks for introducing me to Furls hooks! Now I can vrochet even on my bad carpal tunnel days! I've wondered about the comfort of these hook shapes. It would be cool to win one to try out! My favorite one is the dark purple. I have no idea what size, but that's my favorite color. I love the bright green one! Would really love to win! I would love to try one of your crochet hooks! The hook is too good. Remains me of Harry Potter movie wands....especially the deadly hollow one. I generally use 5mm hook a lot. I can't wait to try one of the Furls hooks! I would love to get a new furls hook! Love your videos and teaching style. Haven't used bigger hooks but would love to try it. I'm sure I'll love it. Completed few projects watching your tutorials. Blackberry is my favorite shade & in such a convenient size! My favorite is that great big Butterscotch one. So hard to pick a favorite hook. They are all so beautiful. Wow! I've been admiring these hooks for a long time. Once the Canadian dollar gets better I told myself I could get one. I don't have a favorite, I love them all! They are gorgeous hooks! I like the lime green hook. Such a lovely crochet hook. I have been looking at these hooks for a while now. Unfortunately the are above my price range. I love your videos. Keep up the great work. This look so pretty. I have been thinking about getting one. Thanks for the chance to win one. I love all the beautiful colors of the Furls Candy Shop hooks. My favorite is the 9mm plum hook. Squeeee! My favorite hook is the plum/purple!! I would love to win a Furl's!! My favorite hook is the G hook - would love one in green. I am in love with the Odyssey Gold hook.... but could never afford to spend that much for one hook... I can dream though!! I cannot just pick one, I want and love them all! They are so gorgeous! I love all of them, but if I had to pick only one, I'd pick grape! I love the colors of the hooks. Hi... I don't own a Furls crochet hook, but I saw the new limited collection for Valentine's day, and the hooks are breathtaking, that intensive red colour makes them one of a kind, so I Would have to say that the Odyssey hook is my favorite. But of course any Furls crochet hook is welcomed any time.. Thanks for this opportunity. My favorite is....ALL of them LOL. My favorite id the GRAPE G hook! Thanks for this sweet chance to win gorgeous crochet hooks!! Love Love Loveeee the plum hook you are using and also enjoy you blog page and your tutorials as well thank you so much for this awesome opportunity, I purchased a furls yarn bowl about 2 years ago and fell in love ...Would live the chance to try the hooks before I order as they are pricey but the craftsmanship is amazingly beautiful! Beautiful! A hook like that would inspire me to complete all of the Star Wars amigurumi my nephew so desires! I love the purple hook. I love the grape hook - my favorite color, and it looks like it would feel so nice in my hand. I like susan Bates Bamboo. Thanks a lot fot his giveaway, I am in love with your crochet hooks, I wish someday I can try one. My favourite are the coloured ones. Whatever the colour is. Send you a big "Hi" from Paris-France. Not sure which hook is my favorite, I love bright colors and I use the I-hook the most often, so maybe an I-hook in red or yellow? Thanks so much for the chance to win! Hi. Thanks for all the great information you provide. I love getting your emails in and reading your posts. Now who would have thought they could reinvent the crochet hook! I adore these hooks! Thanks. I love the "electric" purple one. Couldn't tell sizes. The Furls Valentine hook is just gorgeous! Love these hooks and purple is really great! I love your videos and refer to them often. Thanks for pairing up with Furls! My favorite color is purple so I really like Grape (G/4mm), but my hook size of choice is I/5.5mm (Blackberry). Currently my favorite hooks are the Clover hook but boy would I love to have some Furls hooks. would love to try one of those hooks! I love the look of these hooks! I would love to try them in purple!! Thxs for giving an opportunity to win one of these marvellous looking hooks. enjoy this site and all it's offerings. Adore when some one brings a smile to my face! As I get older, my hands give me more problems, so I now use thick handled hooks. These look like they would be perfect for me and all the beautiful colors make my soul sing!! My favorite in size H, which is Strawberry! Those are beautiful! I want one so bad! Love these hooks - going to have to give them a try. Think the 5.5 size would be a good start! LOVE THE HOOKS,NEED THE HOOKS!!!!! I am seriously in love with the aqua colored hooks. I've wondered for a long time if they would be comfortable to crochet with. Thanks for the giveaway! I usually use N hooks with bulky yarn to make prayer shawls. So I would pick the plum one. I have an Odyssey hook which I adore. It really has made a difference in how I crochet. I would love to find out if the Candy Shop line has the same effect...and they are just gorgeous works of art (much like the wooden ones!) You've got to feel like you're creating a piece of art when you're wielding such a beautiful brush. I have an Odyssey hook which I adore and has made a difference in the way I crochet. The Candy Shop hooks are gorgeous (as well as the heirloom hooks!) and I would like to know if meet up to expectations as well. Creating a piece of art is easy when you have such a beautiful brush to wield. 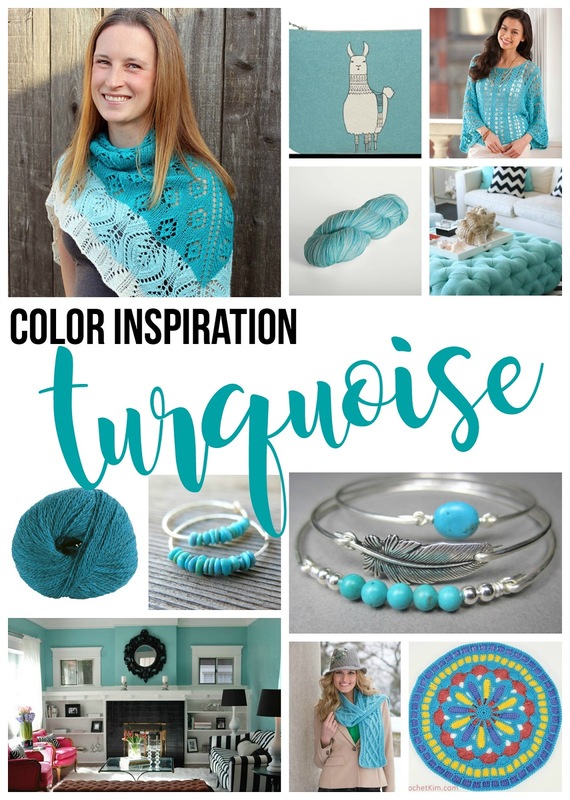 Purple is my favorite color but I love that shiny turquoise!! Orange, orange is my favorite!! My favorite color is purple, so it has to be the beautiful purple G hook. I really like the H hook but it sure is hard to pick just one. I have actually thrown out a rib from crocheting. I think i need furls. Love the colors of these hooks. I have some of the Odyssey hooks and absolutely love them. Thanks for the giveaway! I'm not sure which one I love but I'm pretty sore I would love all of them!! I love the mango hook!